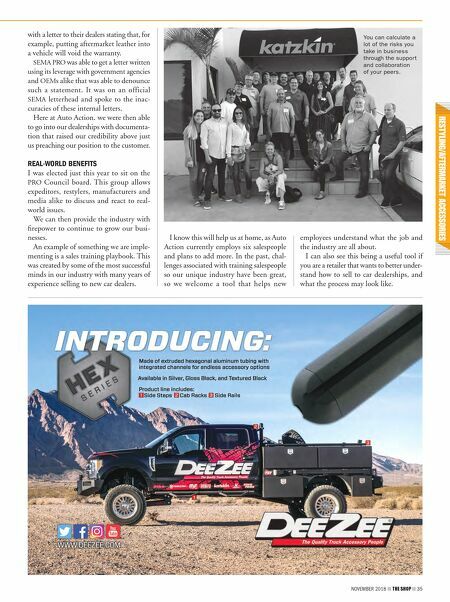 34 THE SHOP NOVEMBER 2018 W hen I started my employ- ment with Auto Action I had very little experience in this industry. I had a good under- standing of business in general, however, and coupling that with decent instincts allowed the company to grow and diversify over the first 10 years of my involvement. Sure, I learned as I went about products, installations and customer service, and I certainly failed as much as I succeeded. It just so happens that, thankfully, the suc- cesses outweighed the failures. I have always been and continue to be very confident and persuasive when it comes to ideas we have for our company. As a shop owner or manager, you must believe in what you are trying to accom- plish—even if you aren't always sure it will work out. To me, that's what leaders do: they take chances. Remember, 100 percent of the shots you don't take don't go in. Even if I expressed doubts to my partner in private, to everyone else I couldn't have been more confident that what we were doing was the right thing and it was going to take off. I've since discovered that working with like-minded professionals allows you to be even more confident that the decisions you make—and the risks you take—are usually the right ones. TIME TO UNITE Roughly five years ago I was invited to join a group called Restylers United and decided to attend a meeting to see what it was all about. I learned very quickly that you can cal- culate a lot of the risks you take in business through the support and collaboration of your peers. I was graciously accepted into a group of some of the most creative minds I have ever worked with. Ideas on how to improve business are discussed; we all contribute our market experiences and debate concepts that some of us have proven either to be effective or detrimental. These topics can range from how much to pay your technicians, to the popularity of new products, to suggestions for new business ventures to help grow revenue. You may be saying to yourself, "Well, my market is different." But it really isn't. Everyone in our group works with new car dealers and most also work directly with consumers through retail channels. We all have the same issues, and cus- tomers react to our approaches in almost identical fashion. Since I joined this group I have been able to grow my business as well as tighten up my operations and installa- tion procedures through our collaborations and suggestions from business owners from other parts of the country. Through the relationships with the RU group I was asked to join the Specialty Equipment Market Association's PRO Council a few years back. 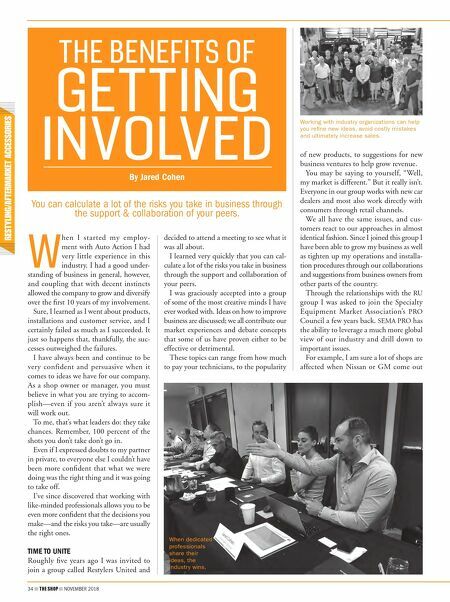 SEMA PRO has the ability to leverage a much more global view of our industry and drill down to important issues. For example, I am sure a lot of shops are affected when Nissan or GM come out THE BENEFITS OF GETTING INVOLVED By Jared Cohen You can calculate a lot of the risks you take in business through the support & collaboration of your peers. When dedicated professionals share their ideas, the industry wins. Working with industry organizations can help you refine new ideas, avoid costly mistakes and ultimately increase sales.